Simpeak Apple Watch Case 38mm, [2 Packs][All-around] Soft Screen Protector Bumper Cover for 38mm Apple Watch Series 2/Series 3, 4 Models for your choice. 4. As the nature of this product, this apple watch case may cause the moisture between this case and the apple watch. Lightweight & Slim --- Soft and flexible material keeps your Apple Watch lightweight and easy to install, 1.1mm Slim, offer external surface protection to your watch. Thin minimal design is perfect for flaunting your new Apple Watch. 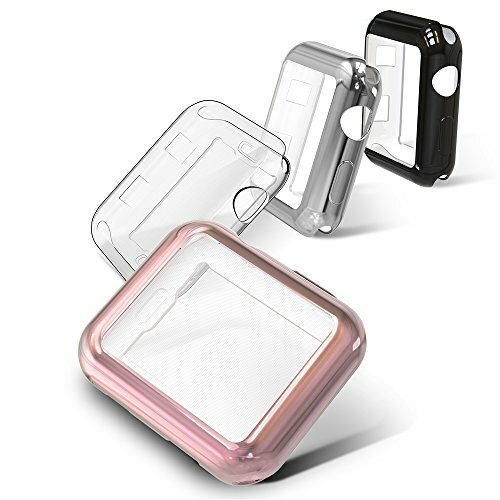 4 Color for Your Choice --- Come with 4pcs, 1x transparent, 3x Plating case(black, rose gold, silver- which makes your case shinny), different watch band to change the diffferent color case.